Salvation And Survival: Is CERN Recreating the Tower of Babel? 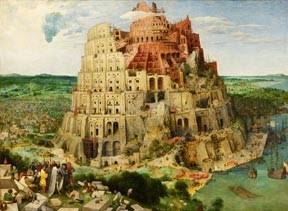 Is CERN Recreating the Tower of Babel? Are you ready for a mind-blowing topic? If you are reading this blog post today, then we can determine that the world has not been sucked into a dark vortex, or atomized into more than a trillion particles. If you are wondering why I would make that astounding statement, it is because yesterday, March 15, 2015, CERN was set to restart its Large Hadron Collider (LHC) for its second 3-year run. This event would have seen the world's most powerful particle accelerator double its collisional energy. (As of this morning, I can find no news reports or evidence that they went through with their plan. I guess we will have to wait and see if they make some kind of big splashy announcement). But I plan to show you how, once again, Man is trying to "become like God". And we know what happens every time we try to break into that barrier that separates us from the throne room of God, right? Is this what Nimrod had in mind? To begin with, if you are like myself, and you are not really sure what CERN is, or what it does, all we really have to go on is information that they disseminate about themselves on their own website. In the course of describing their mission, CERN maintains that they are an organization of European physicists and engineers who are "probing the fundamental structure of the universe. They use the world's largest and most complex scientific instruments to study the basic constituents of matter – the fundamental particles. The particles are made to collide together at close to the speed of light. The process gives the physicists clues about how the particles interact, and provides insights into the fundamental laws of nature." The pursuit of discovering how matter is created began in 1954. In the past 61 years, the scientists at CERN have developed many accelerators whose purposes include sending a beam through 732 kilometres of solid rock to a project in Italy; boosting negative hydrogen ions to high energies, which will become the source of proton beams for the Large Hadron Collider in 2018; and conducting all kinds of experiments with "super colliders", which boost beams of particles to high energies before the beams are made to collide with each other or with stationary targets. Detectors then observe and record the results of these collisions. One has to ask him or herself, just why do we need this information? Read on. Oh, yeah, one of the scientists involved with CERN -- Dr. Peter Higgs -- is responsible for discovering the "Higgs boson", a particle that gives mass to other particles, and is otherwise known as the "God particle". And that brings me to the crux of my discussion today. I readily admit that I am no scientist, and physics was not my favorite subject in school. But anytime that man determines to explain away the Sovereignty of God in creating the world by dismissing it as a simple matter of "a particle that gives mass to other particles", then I have a problem, and I sense the hair on the back of my neck begin to rise. Furthermore, when these same men begin "colliding" these particles at extremely high energies, supposedly for the purpose of discovering how the universe works, then I also smell a rat. In fact, CERN's own website brushes off the extremely dangerous work of these super colliders by posing these questions: "What is the universe made of? How did it start?" They then want us to buy into their seemingly altruistic mission by assuring us that "Physicists at CERN are seeking answers, using some of the world's most powerful particle accelerators." In reality, what these scientists are doing is smashing protons which are moving at 99.999999% of the speed of light into each other in order to recreate the conditions a fraction of a second after the Big Bang. However, there are many far wiser than I who think that what these scientists are really trying to accomplish is far more sinister -- they are trying to open a wormhole. In case you are unaware of this term, a wormhole is a theoretical passage through space-time that could create shortcuts for long journeys across the universe. Wormholes are predicted by the theory of general relativity. But be wary: wormholes bring with them the dangers of sudden collapse, high radiation and dangerous contact with "exotic matter". 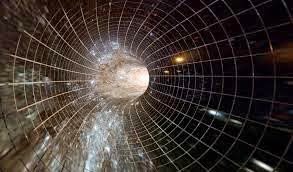 Our knowledge of the existence of wormholes is a result of the research of physicists Albert Einstein and Nathan Rosen, who used the theory of general relativity to propose the existence of "bridges" (which became known as "wormholes") through space-time. Still with me? So exactly why would these scientists at CERN want to create a wormhole? Could they possibly be trying to recreate the mission of a Sumerian king named Nimrod, who ruled over 4300 years ago from Babylon, and thought he could build a tower (actually a gate) to heaven? And what did God do? He destroyed the tower and scattered the peoples across the earth, causing them to lose their common language, and reducing them to strange tongues (babble) so they couldn't understand each other and collectively conspire against Him. In so doing, Nimrod became known by many different names ... Baal, Gilgamesh, Orion, Adonis, Apollo, and in Egypt as Osiris, the god of resurrection. In fact, inside the ancient Greek god Sety’s temple at Abydos, in the Osiris Chapel, is the magnificent depiction of Osiris as a pillar or tower. The Egyptians called this Osiris pillar the Ta-Wer or ‘bond between heaven and earth’. This sure seems to mimic the Biblical story of the Tower of Babel, doesn't it? Think it is just coincidence or some ancient fable? But what does that have to do with CERN and its mysterious. and potentially dangerous, experiments? Does it make you nervous at all that scientists are messing with the universe, and attempting to open a hole -- or portal -- to the unknown? Is this what Nimrod was trying to do? If you are a student of the Bible then you know that there are levels of "heaven", and the "dark forces of the spiritual world" live in the second heaven. Remember Ephesians 6:12, in which the apostle Paul tells us, "For we do not wrestle against flesh and blood, but against the rulers, against the authorities, against the cosmic powers over this present darkness, against the spiritual forces of evil in the heavenly places"? Could these be the "exotic matter" that we have the potential to come in contact with through wormholes? Was Nimrod trying to gain access to that next realm and enlist the spiritual forces of evil in his quest to conquer God? Did he think that opening a portal, or gate, to this next realm that these forces could "come through", so to speak, and strengthen his position, as well as increase his knowledge of how to overpower and become like God? The prophet Daniel mentions such beings as "Watchers", or holy ones, who report to God and make decrees on behalf of God. But Watchers were also mentioned in pseudepigraphal books, such as Enoch and Jubilees, which were popular and influential in the First Century, and ranked alongside the Torah, Psalms and Isaiah in importance to Jews. These apocryphal books were also alluded to by Peter and Jude in the New Testament, giving them at least historical credibility. In these instances, "Watchers" were among a superior class of angels, some of whom fell from heaven, led astray by Satan. In the 7th and 18th chapters of the Book of Enoch, some of the Watchers who fall are imprisoned in the 2nd heaven, and others are cast to earth where they take human women (Enoch 7:3, 18:4) who bear giant offspring (the Nephilim of Genesis 6). Again, I ask: Was Nimrod trying to open the gate to this 2nd heaven? And what was his goal ... to slay God and take over the throne? If you read the historical text of the Book of Jasher, you will find this about Nimrod and the building of the Tower of Babel: "And the Lord knew their thoughts, and it came to pass when they were building they cast the arrows toward the heavens, and all the arrows fell upon them filled with blood, and when they saw them they said to each other, Surely we have slain all those that are in heaven." Or was Nimrod trying to create these "wormholes" to allow the Watchers to enter our realm, enlisting their aid in order to gain their knowledge of heaven and help him (Nimrod) attain his goal? And zooming into the 21st Century, is it possible that these CERN Scientists have already opened portals with their discovery of the so-called "God particle"? I could certainly entertain that concept as I witness the increasing amount of Evil present on the Earth. They may not be using arrows to create a portal to the next heaven, as Nimrod did, but wouldn't their powerful beams of atomic matter serve the same purpose? In order to fully dissect all the implications of CERN and their experiments, it would take me days of singular posts. I'm not sure I could ever adequately cover all the connections and significance to our future. Suffice it to say, that my spirit discerns something more than just scientific advancement for the future of mankind. 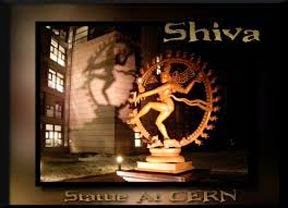 The sculpture of the ancient Hindu goddess Shiva (coming through a portal) at the entrance to the CERN headquarters in Geneva, Switzerland does nothing to allay my discomfort. Shiva is the third god in the Hindu triumvirate. The triumvirate consists of three gods who are responsible for the creation, upkeep and destruction of the world. The other two gods are Brahma and Vishnu. Brahma is the creator of the universe while Vishnu is the preserver of it. So that leaves Shiva as ... you guessed it ... responsible for the destruction of the world. Still think CERN is all about scientific experiments? And it doesn't help to qualm my fears when I hear famed scientists such as Stephen Hawking sounding the alarm bells; it seems somehow prophetic when he warns that the "God Particle" could destroy the universe. Other well-respected scientists warn that CERN's Super Collider is so powerful it could produce particles of dark matter, the mysterious stuff whose gravity holds the galaxies together. They warn that there is a possibility of a cataclysmic event in which CERN creates a black hole that swallows the earth ... their words, not mine. I certainly am not qualified to make any kind of prophetic statement or even guess as to where this all leads. I only know that it seems that once again, instead of worshipping the Sovereignty and Supremacy of God, Man thinks he can become equal to God, or ... heaven forbid ... become greater than the Creator of the Universe, Himself. That only leads to inevitable judgment, devastation and God's justifiable wrath. Have we become as arrogant and rebellious as Nimrod that we are about to repeat ancient history? God have mercy on us! If you are interested in reading more about CERN and its connections to the Tower of Babel, click here and here. Hebrews 11:3 "By faith we understand that the universe was created by the word of God, so that what is seen was not made out of things that are visible." For Encouragement, read The Vernal Eclipse Patterns by Luis Vega at http://www.rogershermansociety.org/homework. You will be amazed. I find it very strange that Indians sculpted the God to resemble a women and not Shiva the male - Transgender agenda ? You may want to read up what the Open Scroll Blog says about this... What in the WORLD for, is there a 'dance' choreographed for this event? your right! i dont get that myself! Ive seen on video of the scientist doing the dance in the facility!..smh like wtf!! Just released Wednesday afternoon, March 18 on YT from MrCati: CERN IS the God Particle. Shiva represents Satan as all-knowing, omniscient and omnipresent. How can he be? Through TECHNOLOGY. Shiva is called the sleeping destroyer the Hindu version of Appollyon/Abaddon. Since Satan is on earth deceiving than Shiva is not likely Satan. Job 26:5 hints to Abaddon connection to Days of Noah and the flood. "Dead Things are formed beneath the water and the inhabitants thereof, Sheoul is naked before him and Abaddon (destruction) has no covering. The word "rapha" from Rephaim is used here as "Dead thing" a reference to various Nephilim tribes. Shiva is Abaddon whose authority is from Satan - and he is also the "beast from the sea" that was and is not; and yet is because he is bound in the pit. You can see this correlation easily as Shiva idol is depicted with sea trident like Poseidon. Shiva is also has mark of the beast - right hand and forehead Talika (literally) mark in Hindi a religious mark used by devotees. 1 And the fifth angel sounded, and I saw a star fall from heaven unto the earth:: and to him was given the key of the bottomless pit. I agree! I have read all of Rob's books and heard him speak. Valuable information! I know you're merely projecting and personifying here, but the only thing God created was the connection to humanity, that's it. God never literally created everything, all of it was already here before God ever showed up. God is not some external object which interacts with things single-handedly, that's absurd and moronic. God is internal only, found in humans only, and uses us as a host to interact with the outside world. And, that interaction would include CERN and the LHC while studying the Universe, because God want's to know too. You people are so ridiculous with your proclaimed "Super Gods", no such thing. God is just as lost as we are when it comes to new discoveries. At least 1 human has to know about it first before God knows about it. When are you going to get that through your thick skull? You're the MORON, anybody with half a pea brain would know that only God could have created such a beautiful, majestic and wonderful world. I pray you find Christ Jesus as your personal Lord and Savior before it's too late! As a great voice from yesteryear statd, "for those of us who believe no proof is necessary, for those that do not, no proof is possible! Blessed to he saved by God's grace and mecy!!!! Better to die and be correct in the belief of the sovereign Creator, than die and be wrong. Eternity is a long time to wish for a "do -over." Its not blind faith either. He speaks to those that truly love Him. Reveals His heart and nature. Peace brother. I guess we will both find out the answer to your ... um, interesting ... discourse, the moment after we die, won't we? I'm just trying to figure out why my belief in God as Creator makes you so angry. I pray that your search for answers will lead you to His Truth. What evidence is there of evolution? Darwinian evolution is a scam used to passify the masses and hide our true history from us. It makes NO sense. I'm pretty sure if we really knew who we are and where we came from, we wouldn't be writing on this website. Please stop regurgitating these established 'facts' as truth. Anonymous, you would be concerned about a goddess that contradicts the One True God, because she will try to tempt your faithful son into worshipping at the altar of an idolatrous religion, and coax him to rebel against God (note the capital G), and send him straight to hell. It's that simple. Thank you for saying so collected while debating those who do not keep the same beliefs as you. It is important not to lose ones temper when answering a question brought up by some one outside the faith. I see these little 'jabs' taken at each other and wonder who might come to know God and Jesus, as we do, by being called a moron? Belle keep spreading God's word. Keep love in your heart. Thank you for the encouragement! I agree with you ... we are all called to walk in Jesus's footsteps and to become more like Him. I try to model Him whenever I am faced with such criticism, and present a Biblical argument in response. That makes the personal attacks irrelevant. I don't understand too much of this, but if it taking these guys so long and they are still trying to put stuff together to do it, how and who did it 8in the first place? That only God, and surley it was Him, that is why these self acclaimed geniuses are having such a problem trying to prove something that is already proved. I believe it is bigger than that ... I believe it is part of the spiritual warfare that Satan is waging on mankind. This project is no different than Satan influencing Nimrod to build a tower high enough to transcend into the spiritual realm (and open a portal, a doorway into that realm). Once that portal is open, then Satan can send his " spiritual forces of wickedness" (as mentioned in Ephesians 6) down to earth to torment and oppress God's people. This is just a new version of Satan's plan ... Tower of Babel 2.0, if you will. Wow! First of all, your argument is a little … well … difficult to follow. That being said, I would venture to say that you haven't read the Bible, but have only adopted a theory about it, based on hearsay and others opinions. You don't have to believe what I do -- every individual must decide for themselves. But have you ever thought of what happens to you one second after your last breath? That's a pretty daunting question, isn't it? And you say you believe in god … I will pray that the One True God reveals Himself to you, and you will be delivered from the lies you've been told. Romans 1:28: "Since they thought it foolish to acknowledge God, he abandoned them to their foolish thinking and let them do things that should never be done." It is truly sad the things people go through in life to think the things that they do.I would rather take the chance in believing that there is a God and live as much in peace as I can rather than live an angry negative life always feeling sorry for myself because my life isn't the way I want it. God Bless you Belle and thank you for the humble words you choose to say. Thanks be to God. Your comment about Nimrod "sitting" on God's throne I thought was interesting as that's what you see in one of the Hunger Games images, which was pretty much about Nimrod/Sagittarius deposing God. Great comment! Thanks for sharing that perception! I am thanking the Lord that there are more and more people doing as you suggest … asking for WISDOM. And just as you say, you better be sure that's what you want because all your earthly foundations will be shaken to the core. Hang on because God is going to start opening your spiritual eyes to HIS TRUTH -- not the world's, and not your own. And once you tap into His Spirit you can never go back to being blind. I thank you for your wise comment… well said!